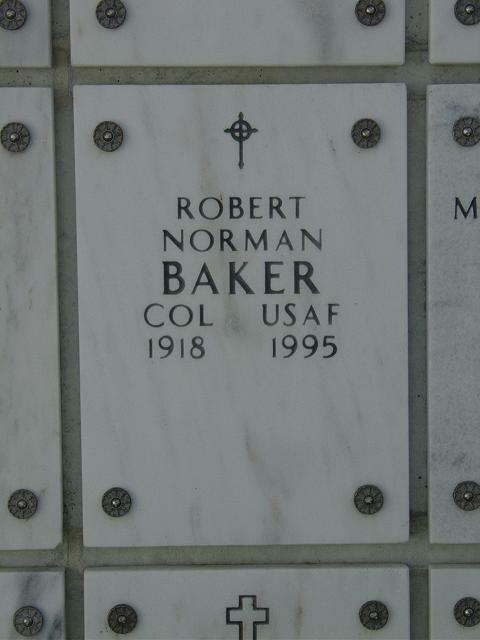 Robert Norman Baker, a retired Air Force colonel, died July 23, 1995 at his home in Callao, Virginia from congestive heart failure. He was 76. He began his Air Force career as a P-38 fighter pilot in 1941, after graduating from Penn State University. Colonel Baker's initial assignment during World War II was on Attu in the Aleutian Islands. He was a command pilot and served with the Tactical Air Command as a group operations officer and deputy wing commander. He also was a Tactical Atomic Wing commander and plans director at Tactical Air Command Headquarters. After retiring from the service in 1961 as assistant director, office of legislative liaison for the Secretary of the Air Force, Colonel Baker worked in the space program of American Machine and Foundry. Later, he worked in various administrative positions in the US Office of Economic Opportunity, the National Water Commission, and the Federal Election Commission before retiring a second time in 1983. Colonel Baker was a volunteer with the US Coast Guard Auxiliary. Survivors include his wife Pim; a son, Robert N. Baker Jr.; and a daughter, Patricia Ann Baker. His funeral will be held at 1 pm Thursday at Fort Myer Chapel. Inurnment will be at Arlington National Cemetery Columbarium.